free estimates and computer design. We build beyond code. That means a floor that won't start sagging. from the house. A handrail that won't become flimsy. companies decks. But I guarantee you won't see it with ours. 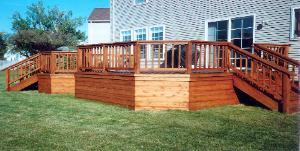 We can design out a deck to meet any budget.